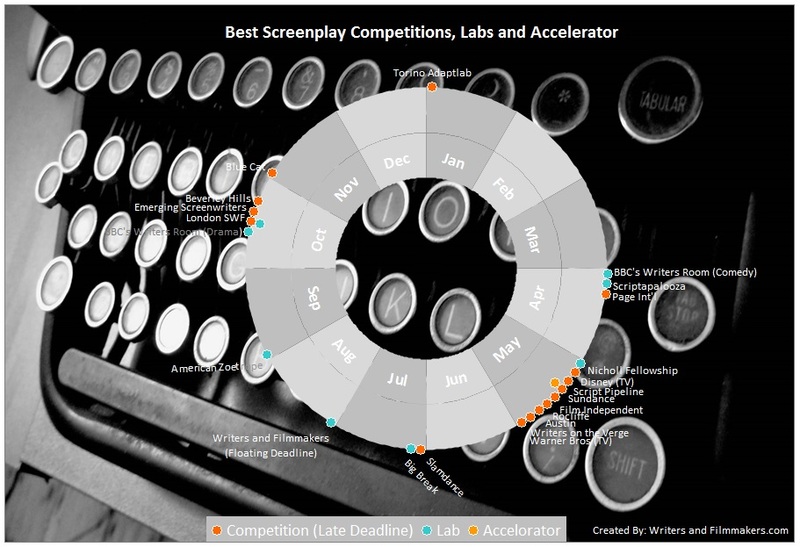 Many thanks to Jonathan at WritersAndFilmmakers.com who’s got in touch with this fab infographic on the best screenwriting competitions and initiatives for screenwriters. As you can see very obviously (and as I always go on about! ), there ARE times of the year that are quieter than others, whereas there are other times that are VERY busy on the competition calandar … So, it really pays to get organised and get your writing done during the quiet times, so you can ensure your screenplay is ready to submit during the peak times! If you’re wanting submissions tips for your screenplays, check out Submissions Insanity, my column on Scriptmag as well as the PDF Submissions Checklist on the B2W Downloads page. For more resources on submissions strategies and processes, don’t forget there’s a “submissions” label on this site, as well as the B2W Resources Page. Good luck! The writers review films and decide the best filmmaker. The filmmakers read scripts and decide the top 10 scripts. The winning filmmaker selects one of the top 10 scripts to shoot and we fund the production. The screenwriter gets paid and their script made. The filmmaker gets funded to shoot the script. Imagine a community that reviews your work, provides you with abundant, meaningful coverage and provides the potential for your skills to be translated onto the big screen. Writersandfilmmakers.com goal is to democratize film production and film funding. Check out the website HERE, follow us on Twitter, HERE or LIKE us on Facebook, HERE.